If you've ever had to share an external drive between Windows and Mac OS systems then you'll know it can be, well, something of a challenge. Macs only come with the ability to read Windows NTFS partitions, and PCs can't see a Mac's HFS+ partition at all, so you'll probably end up cobbling together a messy FAT32-based compromise as a file system that both computers can read. But there is another way. Install Paragon HFS+ for Windows and your PC will immediately gain the ability to both read and write Mac OS X partitions. 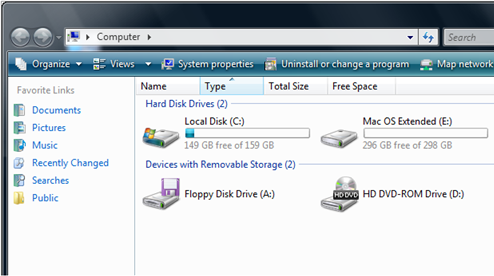 The program comes in the form of a file system driver, so there's no extra interface to learn, no options to set. Just use the Windows Disk Management applet to mount an HFS+ partition (the Help file explains more if you need assistance) and you'll be able to see it in Explorer, drag and drop files there, or use the drive in applications, just like any other. Please note that this is the commercial version of HFS+ for Windows. There's also a separate free edition. The commercial edition (available here as a trial), works with all editions of Windows from XP upwards, includes unprecendented high-speed HFS+ performance, full access to HFS+ partitions (read and write access) and much more.